Now that we have the outside of the rails cut, now we need to cut out the inside. Note, one will be wider than the other as it will rest on top of your racetrack. I went with 3.5 inches for the width of the top one, and 2.5 inches for the bottom. Use the homemade compass to make your arcs again. Use your compass again to draw the arcs. 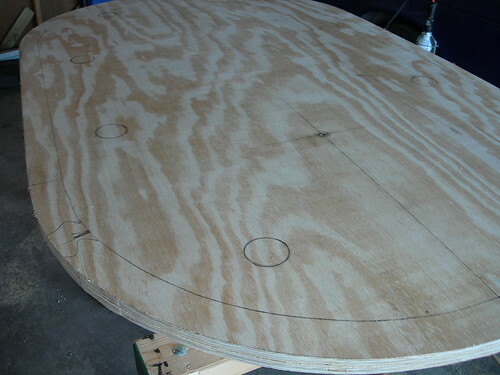 Use a drill to make a pilot hole for your jigsaw. Remember, all of these edges will be unseen so don’t beat yourself up if you mess up.